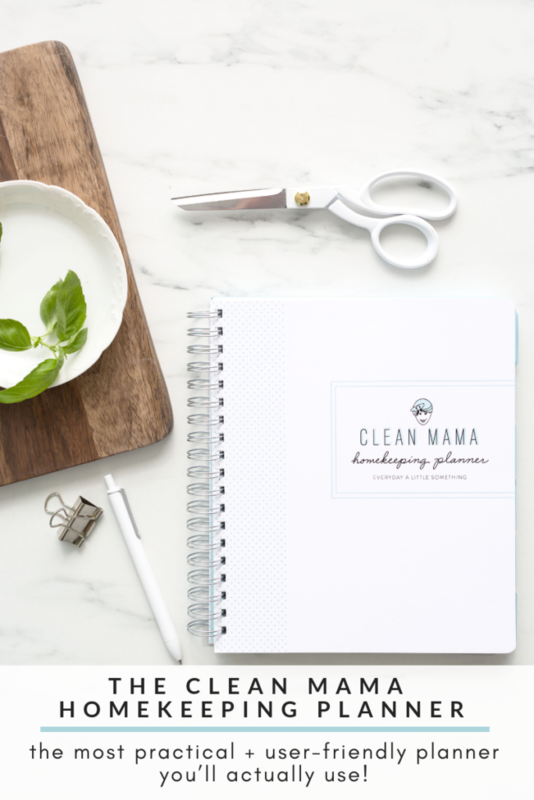 NEW Clean Mama Homekeeping Planner + Pre-Order NOW! 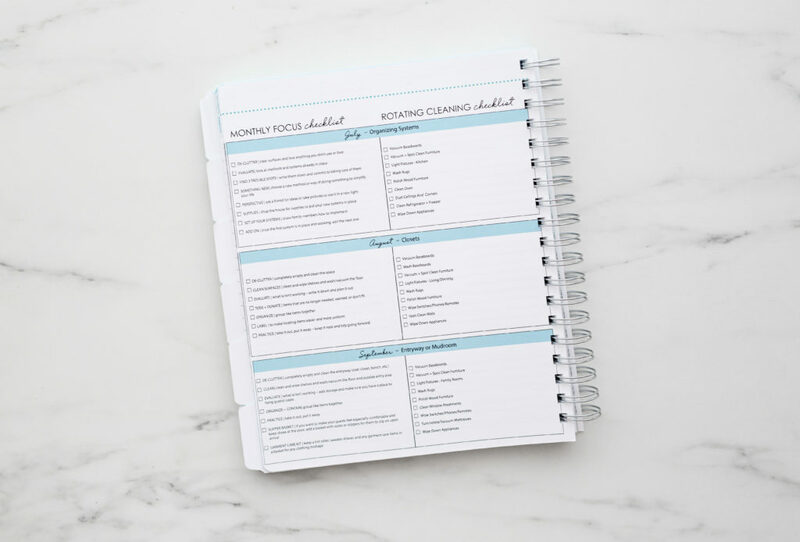 I have some exciting news to share with you….after months in development and revisions galore, there’s a *new* larger sized and updated Clean Mama Homekeeping Planner. This is the planner you’ve been asking for and I am thrilled to share it with you today! Why would you want to pre-order the new planner? This is the ONLY order I’m placing before 2019 and all pre-orders SHIP FREE! Orders will ship in the order they are received – order early to ensure your planner goes out first! 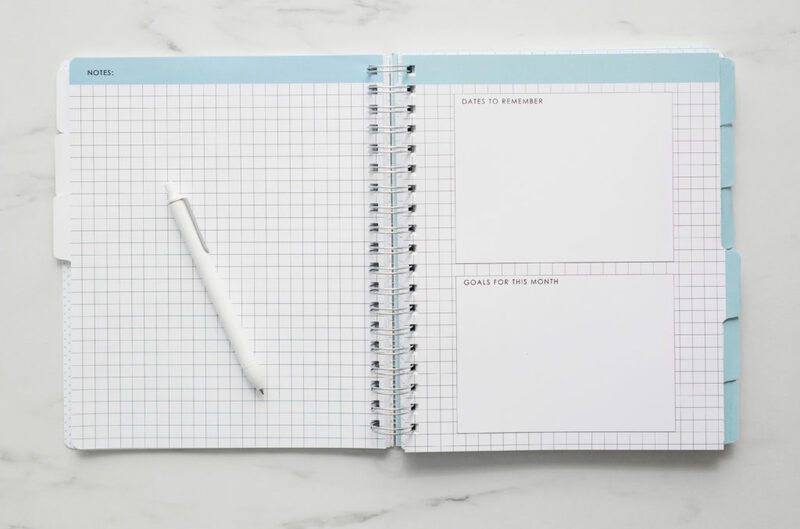 This new format for the Homekeeping Planner is larger (it’s the same size as my Daily Planner) and it’s decidedly streamlined, efficient, and simple. 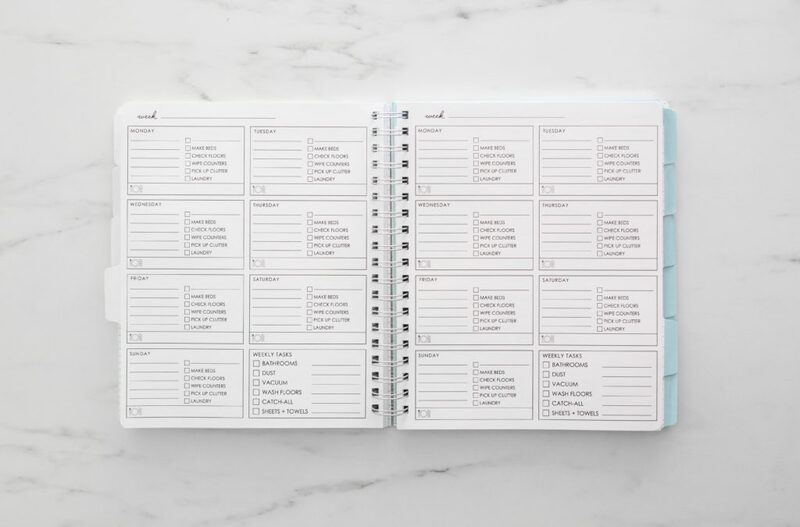 It’s everything you’ve been looking for in a planner and haven’t been able to find. It’s what will help you stay on track with homekeeping in a simple and sweet new format. For years I cleaned on weekends and hated it because once Sunday night hit it was back to work. I started looking for a better/different way to organize my cleaning tasks in a way that made it feel less overwhelming and left the house clean most of the time (with little effort). That’s how my cleaning routine was started. It was put to the test when I was pregnant with my 3rd, working multiple jobs and running Clean Mama and guess what? The routine still worked even though I was exhausted and had no desire to clean. That simple cleaning routine? It’s something you can do too! 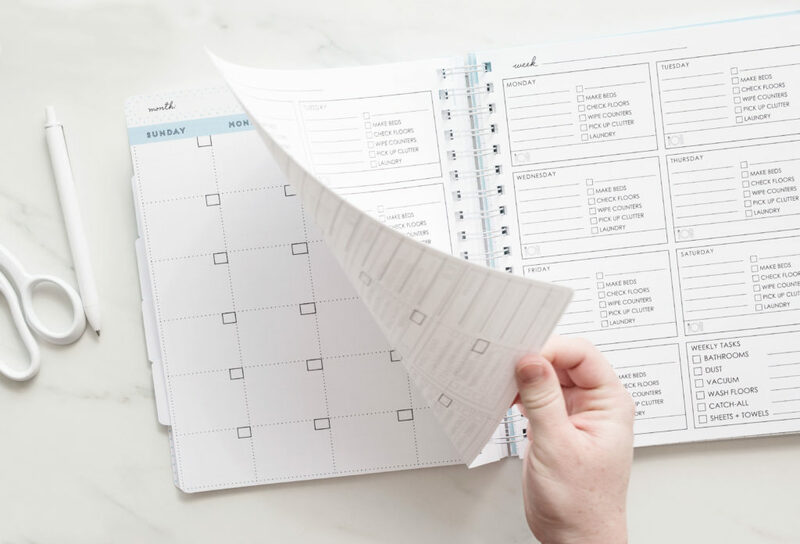 The new Homekeeping Planner has my routine throughout and will help you (yes, you!) keep up with your home and life in a simple and effective way! It’s undated! Why? Because I know it’s essential to be able to start ANYTIME and re-start as needed. We all get side-tracked and there’s no need to feel defeated over a planner, let alone the state of your home. 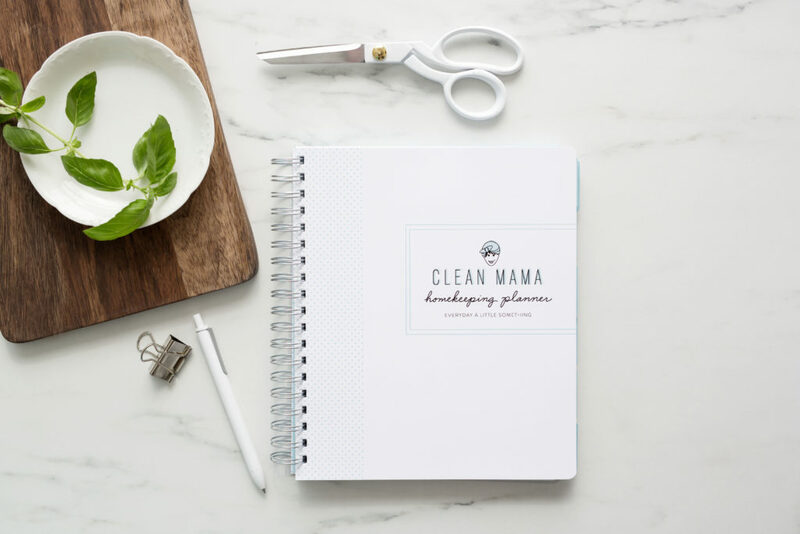 The Clean Mama Homekeeping planner is the only planner that will give you all the grace you need to keep going all year long. 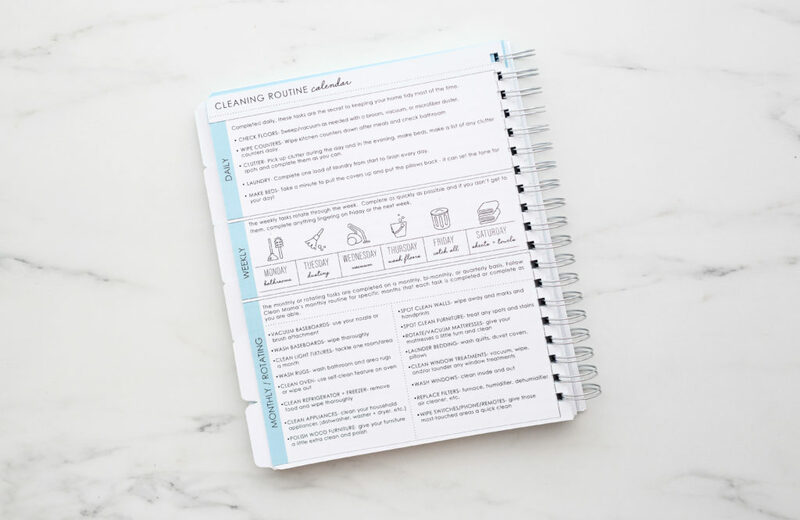 The Clean Mama Homekeeping Planner has a larger format complete with 12 months and 12 blank monthly tab pages with a place for you to jot down important dates to remember and goals for the month ahead. Put sticky notes on these pages for little lists or jot down your notes right on the pages. You’ll also notice my favorite NOTES pages throughout the planner. Use these as placeholders for important tasks, things you don’t want to forget, phone numbers, internet passwords, whatever you want to keep track of. Every month starts with a darling, blank 2-page calendar with a simple to do list on the right hand side. I love this format – just the right amount of room! 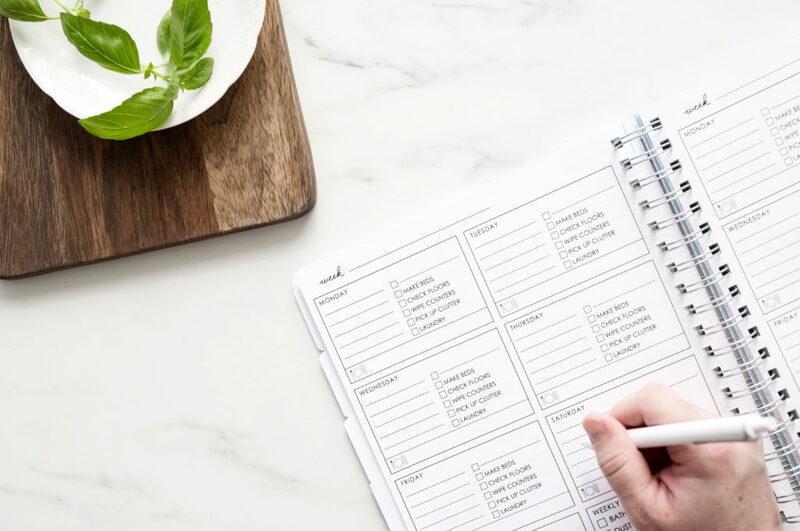 Before each new month, jot down important dates and appointments – I use the to-do list as a brain dump for the month ahead. Then as I’m able I transfer the to-dos to the weeks and things get done. What am I most excited about in the new Homekeeping Planner? Each month has 5 weekly dockets. You’ll see that each day has my daily tasks listed (make beds, check floors, wipe counters, pick up clutter, laundry) and a spot for each day’s main meal. Take a peek down at the bottom right hand box of each week – do you see the Weekly Tasks? They are in order of the days of the week but they can be filled in as you get to them during the week. This is for those crazy weeks or for those of you that mix and match my routine to work with your schedule and it’s for those of us that follow it to a ’T’. I love this feature! I truly believe that every day is a fresh start. I hope that this is just what you need to keep track of your homekeeping, menu planning, and anything else you want to make note of. If you need help as you’re using the planner, the planner also has a Cleaning Routine Calendar at the back for you to reference anytime. 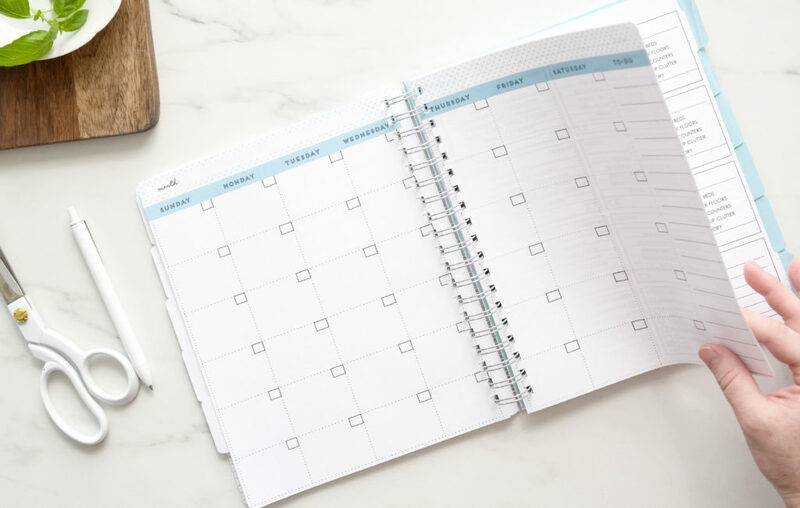 Wait until you see the next features – I share my rotating cleaning tasks with you on my free calendars but my monthly focus is something you’ll only see in a subscription to Homekeeping Society, but for 2019 I will be sharing some tips once a month for each month’s focus – January is Clutter. This is something that I am really excited to be sharing with you. We’re going to be working through our homes all year long…together! Having a monthly focus is wonderful for not getting overwhelmed and for just making sure we’re keeping our homes cozy and clutter free. Check it out – these two checklists are on the same page (I love this – it makes it so easy to see everything). Rotating Cleaning and Monthly Focus pages – 1 for each quarter, 4 pages total – every month is different! This new Homekeeping Planner is available for a super quick pre-order now! What does that mean? You only have 4 days to place your pre-order! I’m going to place the order on Monday at noon cst, December 3rd (you won’t be able to order after that) and they will start shipping by December 17th so you’ll hopefully have them by January 1st. I also added a video to my YouTube channel if you want to take a peek! But do I have to order from the States? I live in Europe. Can we buy this on Amazon, for example? I would LOVE to buy it from Amazon. I currently ship to the US and Canada but check out MyUS for shipping. They are a parcel forwarding service that allows my international customers to order from my shop. Can we order from the UK? This looks amazing! How is this different than the Homekeeping planner I purchased a few months ago when you had the special rollout? Hi Becky, can I purchase this planner I live in Australia via Amazon? I currently ship to the US and Canada but check out MyUS or ShipMate for shipping. They are a parcel forwarding service that allows my international customers to order from my shop. Have the planners started to ship yet? I haven’t been able to find any updates to this post or order. Yes they have! They are still shipping and should complete by the 26th. I haven’t received any notifications that mine has been shipped out as of today – 12-26-18. Is there a place to check on it? Thanks! I’d love to order one- are you going to get them back in stock? Thanks! Yes, they’ll be in in a couple weeks!